Amitabul is not like every other Asian-style vegan restaurant you've been to, and that was an amazing surprise for me. I expected the typical beef-style seitan over brown rice, and I was excited and prepared for that. That style of food has its place in the vegan restaurant world, I think we appreciate that fact. What I got at Amitabul was so much better. 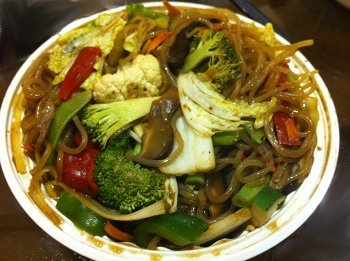 They use a macrobiotic style to their Korean food, making everything with whole food products, with an emphasis on seaweeds and fresh vegetables. I love how the menu describes the healing powers of the different vegetables-- we all know you can treat illnesses by changing what you put in your body, and I love a restaurant that calls attention to healing foods. All of the portions at Amitabul are enormous. We each ordered one entree and one healing noodle soup and either would have been enough for us to split and probably still take home leftovers. Add that to the appetizer and dessert we ordered, and we left with quite a large takeout box. 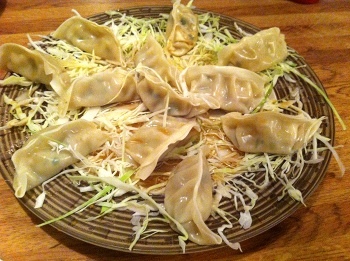 We started with mandoo vegan dumplings, which were the only thing we ordered that I'd just call, "good." My husband did love the little pieces of soy inside, but at this point I still felt like we were at the standard vegan Asian restaurant. We had Dr. K's Cure-All Noodle Soup, which was insanely good and changed my mind forever. Again, since I was expecting the typical Asian soup flavor, at first bite I thought it might need a bit of soy sauce or something to salt it up a bit. After a few bites I realized it needed nothing and was amazing on its own. I crave it months later, and I've tried everything I can think of to either find the recipe or figure out how to get it delivered to my house, 7 hours away. The soup had a total of nine vegetables in it (we counted), and each was perfectly cooked and retained its color and crunch. We opted for rice noodles, which reminded me of less-curly ramen noodles. Dr. K's Cure-All soup is supposed to be good for curing sore throats, colds, the flu, and hangovers. I'm not going to admit to a hangover the next morning, but I will say that eating another serving out of the huge portion we took home for breakfast really hit the spot. We also had the soy pancakes, which the owner told us was the best pancake dish. This was my first time trying Korean pancakes, so I didn't know what to expect and can't compare them to anything else, but I can tell you that I loved them. These were packed with vegetables, so when you took a bite you could feel them crunch in your teeth. 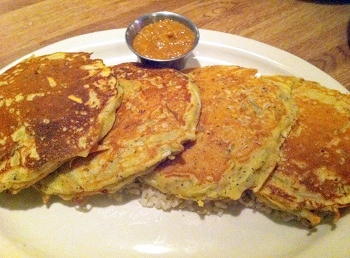 Below the huge set of four pancakes was brown rice, and atop the pancakes you spread a delicious kimchi-esque sauce. We ended up eating half of this dish for breakfast the next day and it was a great way to start the day. We were going to a conference the next day, so we opted to order a few dishes to take for lunch. One of our takeout items was Green and Greener Nirvana, which was a nice mix of green vegetables, seaweed and tofu and served over brown rice. 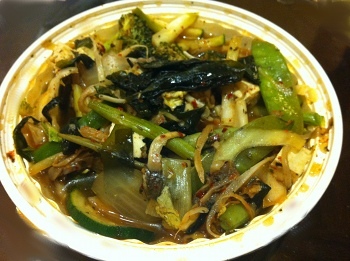 The sauce had a garlicy base and nicely complemented the vegetables. Our other takeout item was the Dark Side of the Moon dish with sauteed oyster and shiitake mushrooms and covered in a black bean miso sauce, served with soba noodles. Both lunch dishes were delicious, and I especially loved that the owner told us he would cook the vegetables very lightly so they wouldn't be mushy the next day. 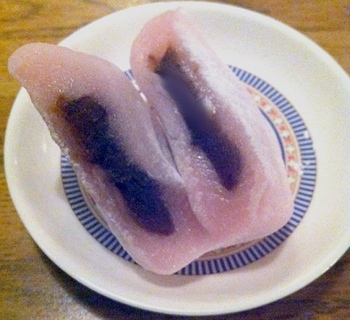 We shared a small red bean paste mochi for dessert, and it was the best I've ever had. The outside was perfectly soft and bouncy, and the inside was sweet and delicious. I'm scrolling through the menu right now (http://www.beyondmenu.com/20772/Chicago/Amitabul-Chicago-60646.aspx?r=20772) and there are so many dishes I would love to try... Yin and Yang, Buddha's 3 Luck, Spicy Kimchi Pancakes, not to mention their homemade juices and teas and their chestnut cookies. I will be back to Amitabul, that's for sure. When I think of the best vegan restaurants across the world, Amitabul is in the top of the list. 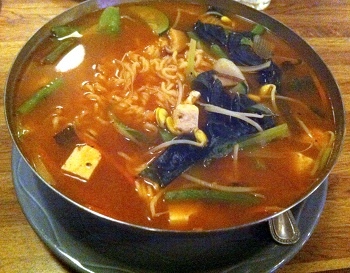 The food was so unexpected and delicious that I think about it often. If you're anywhere near Chicago, you need to take a trip out to this restaurant to see for yourself. It's a haul from the city, but it's so worth it.